Crew shake-ups and reassignments do happen – though they are not “routine” by any stretch. Last year, attention to this was drawn by NASA when astronaut Jeanette Epps was removed from her pending long-duration mission to the International Space Station – where she would have been the first African American to serve as a crewmember of the orbital lab. That crew change prompted questions of exactly why she was removed from the mission; as a rule, NASA does not discuss crew assignments – or reassignments as the case may be – and never divulges exactly why certain astronauts are chosen and others are not. Crew shuffles after assignments are considered official can happen for number of reasons – including personal medical issues, family medical considerations, disciplinary concerns, or simply for personal reasons on the part of the crewmember. Recently, almost all reassignments have been for personal medical issues. Timothy Kopra was removed from the crew of Discovery’s final mission in 2011 when he suffered a bicycle accident just over one month before the Shuttle’s eventual launch. Karen Nyberg was removed from Atlantis’ STS-132 mission when she was pregnant with her first child. Perhaps the most famous medical-related crew shuffle was Apollo 13, when Ken Mattingly was removed from the crew just three days before launch when he was exposed to the German measles – which he never contracted. In all three of those above cases, Kopra, Nyberg, and Mattingly went on to fly subsequent missions. Kopra flew as member of Expeditions 46 and 47, Nyberg flew as a member of Expeditions 36 and 37, and Mattingly went on to fly Apollo 16, STS-4 (Columbia) and STS-51C (Discovery). 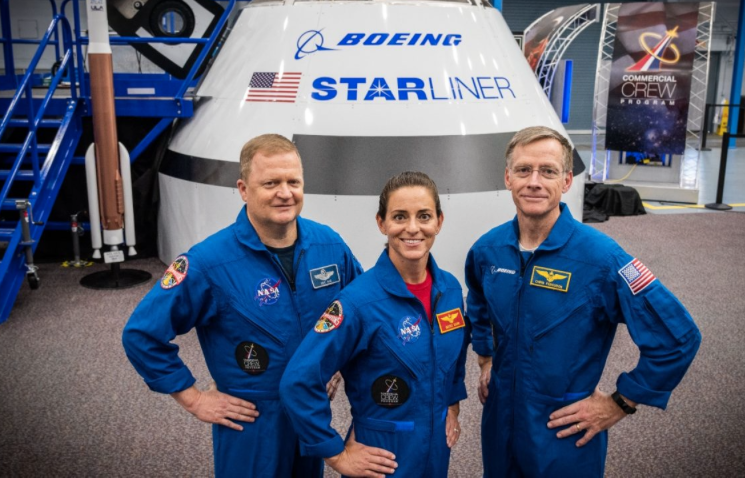 Replacing Eric Boe on the Starliner test flight will be veteran NASA and ISS astronaut Edward “Mike” Fincke. 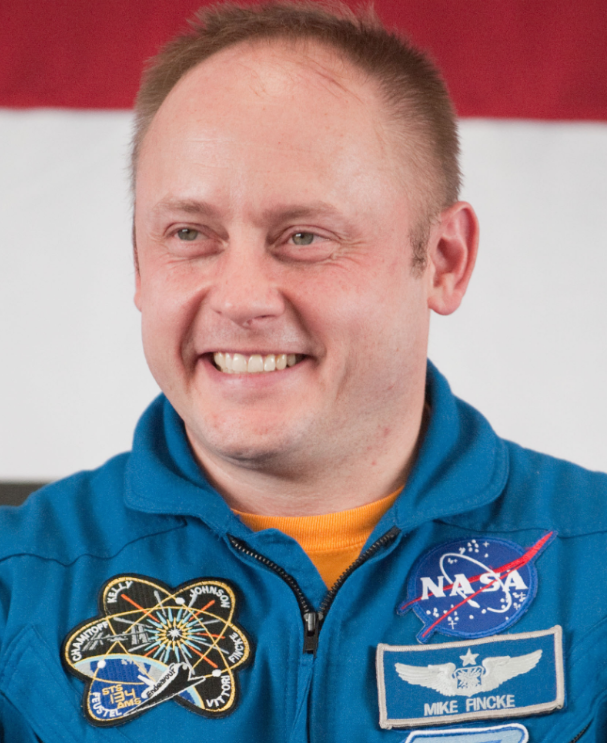 Fincke has flown three space missions to date, two long-duration flights aboard the International Space Station and one as a Mission Specialist on the Space Shuttle. Selected as a NASA astronaut candidate in 1996, Fincke was first assigned to the International Space Station Capsule Communicator (CAPCOM) arena at the Johnson Space Center and also served as a Crew Test Support Team member in Russia for Expeditions 4 and 6. He went on to serve as Commander of the NEEMO 2 (NASA Extreme Environment Mission Operations) underwater mission in May 2002 before he was assigned to his first spaceflight as a Flight Engineer for Expedition 9 to the International Space Station. Fincke launched on the two-person Expedition 9 mission on 18 April 2004 – when Station operations were restricted to just two crewmembers in the wake of the Space Shuttle Columbia accident. Four years later, Fincke launched to space for the second time as Commander of Expedition 18. During this flight, Fincke and his three ISS crewmembers welcomed STS-126/Endeavour and Eric Boe to the Station and also oversaw delivery of the final set of Solar Arrays for the Station on STS-119/Discovery. Fincke was then assigned to his first and only Space Shuttle mission, STS-134. Fincke launched on 16 May 2011 as Mission Specialist #1 for Space Shuttle Endeavour’s 25th and final voyage – helping achieve what was then considered U.S. construction complete of the International Space Station. 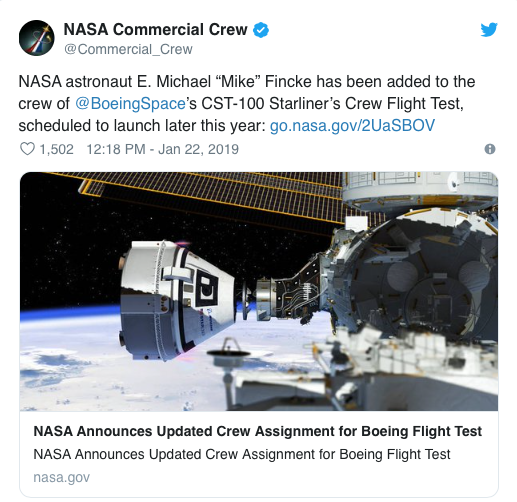 Fincke will now join Chris Ferguson – himself a Shuttle legend – and Nicole Aunapu Mann on the Starliner crew test flight. Currently available schedules from NASA show this mission launching No Earlier Than (NET) August 2019 – though it is expected to slip deeper into 2019.